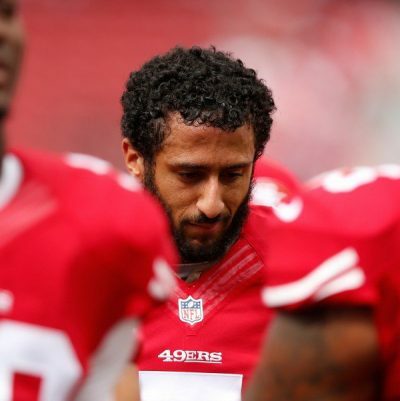 Colin Kaepernick knelt during the national anthem on Sunday in his first start of the season. A chant of “USA, USA” bellowed out at New Era Field in Kaepernick’s 45-16 LOSS to the Buffalo Bills..
Several SF 49ers joined Kaepernick in his pregame national anthem protest during week 6. Those players were also losers, maybe even double losers depending who you ask. 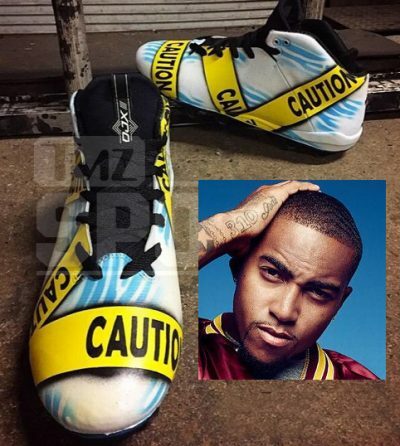 Redskins star wide receiver, DeSean Jackson, plans to take the field on Sunday wearing anti-cop crime tape themed cleats. Jackson commissioned artist Marcus Rivero, aka, SolesBySir, to craft the yellow crime tape design on his cleats in protest of the deaths of African Americans by police officers. 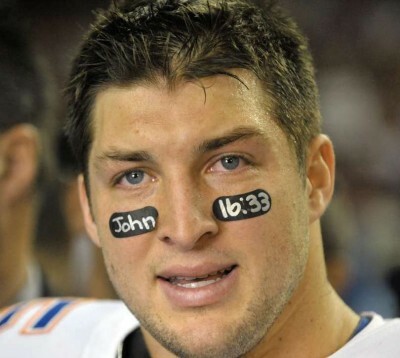 Devout Christian, Tim Tebow, who is taking part in an instructional league for the New York Mets, fielded a question on San Francisco 49ers benched quarterback Colin Kaepernick refusal to stand during the playing of the national anthem. Surprisingly Tebow appears to support Kaepernick’s and other NFL players’ “right to protest,” while questioning the way it is being carried out. 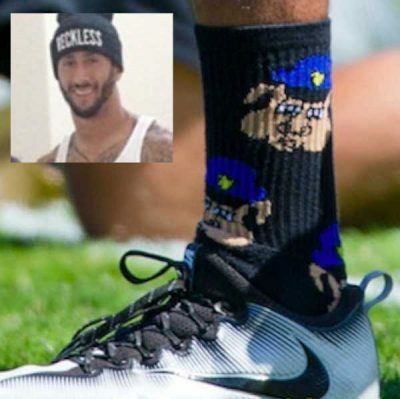 A photo has surfaced depicting starting SF 49ers quarterback Colin Kaepernick wearing “pigs wearing cop hats” practice socks. CBS Sports is reporting that Kaepernick has been wearing the offensive anti-cop socks “since at least Aug. 10,” but somehow hasn’t been asked by the NFL to remove them. Via NFL.com: Forty Niners quarterback Colin Kaepernick has willingly and knowingly immersed himself into controversy by refusing to stand for the playing of the cherished National Anthem in protest of what he deems are wrongdoings against African Americans and minorities in the United States. 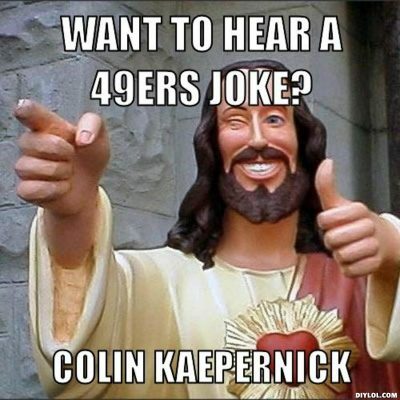 His refusal to stand for the anthem came before the 49ers preseason loss to the Green Bay Packers at Levi’s Stadium. 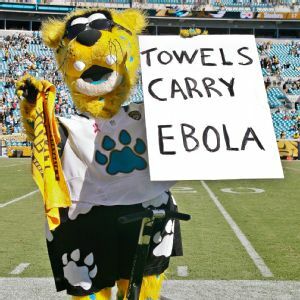 Jacksonville Jaguars mascot Jaxson de Ville is being blasted on social media after displaying a sign causally referencing the Ebola epidemic. Jaxson’s intent was to mock the Pittsburgh Steelers‘ Terrible Towels, but the stunt fell flat. 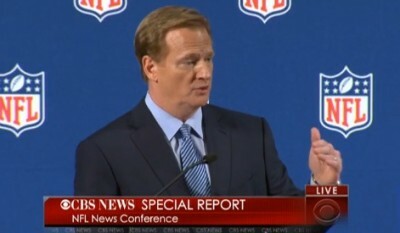 Mark Wahlberg totally left Patriots’ owner, Robert Kraft, hanging..
Roger Goodell‘s NFL domestic violence news conference was disrupted by a screaming man who was detained quickly by security. The man identified himself as “Benji” and pleaded several times “Don’t take me to an elevator!” as he was carted away behind a curtain. 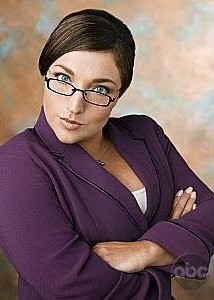 As Adrian Peterson stands in the corner during his NFL imposed time-out, Supernanny Jo Frost appears to help him rid himself of his child abusing ways. 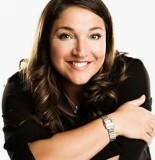 The popular TV nanny contacted the league offering her help, ala parenting skills. 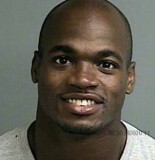 JoJo reached out the to NFL offering up some valuable advice for the embroiled running back in the video below. The reality star and parenting expert, who recently worked with Peterson on an EpiPen promotional campaign, says she was “very saddened” when she saw how Peterson disciplined his child and felt compelled to help. 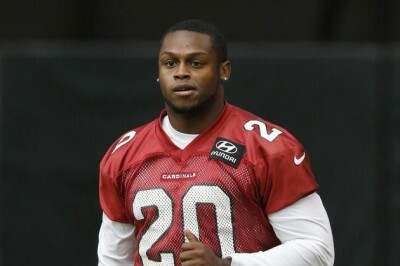 Jonathan Dwyer, former Steeler and current Arizona Cardinals running back has been arrested for domestic violence. Dwyer was pinched after an alleged altercation with his wife at their Phoenix residence.